Whew! Don’t see any of mine there. Yes, but is that a good thing or a failure to market thing? Neil, how about you take a different tact on this theme… Instead of just frequency, use a factor of success and frequency. Rank all the titles, 1-30000 for *quality* or grade or whatever it was that signified the #1, #2 spots, etc. 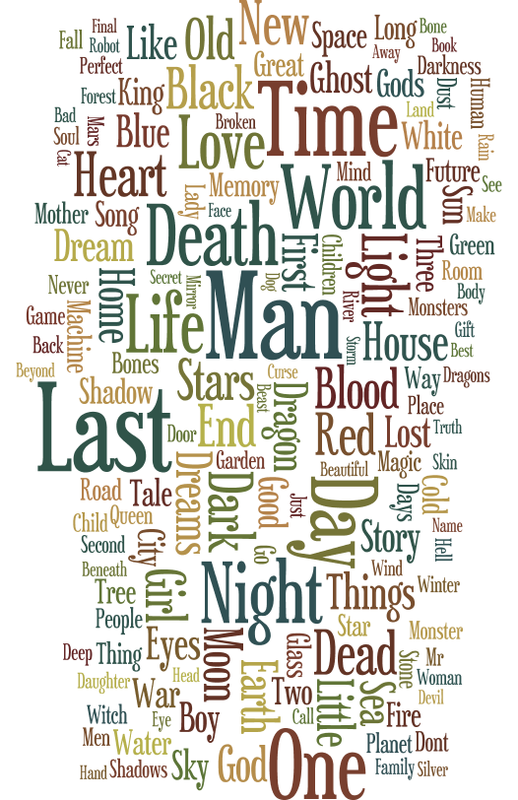 Then assign inverted values to each title (#1 gets 30000 points per word, #2 gets 29999 points per word…) THEN, total up the points per word and build a Wordle from that. Now that would be truly useful for understanding title frequency as applied to success. The places listed were entirely based on frequency of the complete title. It wasn’t an indicator of preference or perceived value. The wordle app only deals with word frequency, so there are limits to what we can do with it.